It's been a month since summer solstice, so one a.m. in Yellowknife is starting to get a little dusky again. 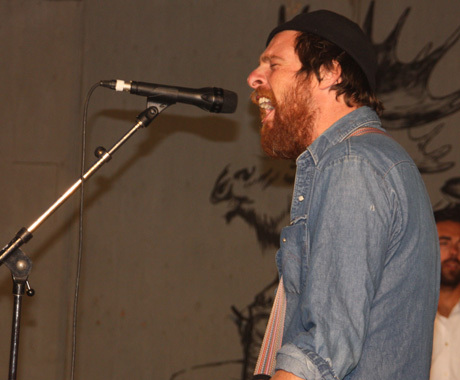 It's dark and chilly and the mosquitos come out, and the only way to fend off the elements is to mosh to Matt Mays, and this is exactly what a large group of Folk on the Rocks goers did on Saturday night. He charmed the crowd, especially a young woman who joined him on stage to dance to one of his songs. This got many other young women pushing to the front for their own chance to dance with the Maritimer. It wouldn't be a stretch to compare Mays to a Canadian Bruce Springsteen, a fact he himself acknowledged, twice, by dedicating a song to the Boss and covering "Glory Days." He also showed himself to be a gracious guest by shouting out a local musician who invited him to jam on his houseboat the night before. Indio Saravanja joined him on stage for a song in return for the hospitality. To top it all off, it wouldn't be a rock show if the man himself didn't break the official "no crowdsurfing" rules by crowdsurfing, much to the chagrin of security, and the delight of fans.